These lightly dusted, home-style oysters are hand battered with a special blend of seasoned flour (32%), prefried, then IQF processed to seal in their naturally mild salty flavor. Ready to serve in three minutes. Sauce, Toss and Serve Buffalo-sylte, with Thai Sweet Chili Sauce, Asian Sesame Garlic Glaze of any other sauce of your choice such as Caribbean Rum Sauce. 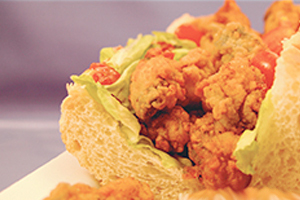 May great entrees, appetizers, bar/party food and New Orleans style po-boy sandwiches. All Content Copyright © 2004-2013 Gulf Marine Products, All Rights Reserved.